Although your baby may not yet use many words, he talks to you by smiling, laughing, babbling, and crying. You can adapt your communication methods to your child’s special needs. Here are some fun and easy ways to keep your child talking with you. Throughout the day, listen to your child and respond to her efforts to communicate. Pay attention to how your child expresses her feelings. Does she fuss when she’s tired? Wiggle when she’s excited? 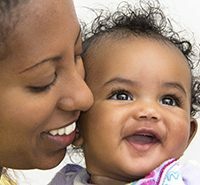 You can match your baby’s laughter and facial expressions, or respond with words that label her feelings. Maintain eye contact and respond to your child’s babbling or speech, reflecting the different sounds he makes. 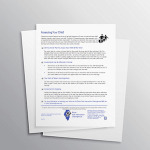 Be sure a child with a hearing impairment can see your face when you speak. Speak clearly and use gestures and simple signing. Respond when she communicates with smiles, sounds, or gestures. You may want to touch a child with vision impairment gently before you speak to him. Place his hand gently on your lips so he can feel your smile. Feeding times can be busy, but they can also be good times to talk with your child. If you know your child is hungry, reassure her that you are getting ready to feed her. If your baby is eating solid foods, name the food you are giving him. Talk about the high chair, utensils, stove or microwave, and other items you are using. 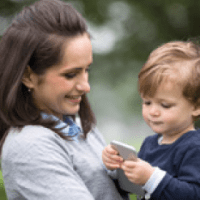 Whether you are in the car, shopping, or just going for a walk, on-the-go moments are great times to talk with your child. Talk about what you are doing, where you are going, what you will do when you arrive, and who or what you will see. Use gestures such as waving to help convey the meanings of words like hello and goodbye. Identify colors and count things you and your child see. Help your child to match your actions, including clapping your hands, throwing kisses, and playing games such as pat-a-cake, peek-a-boo, and the itsy-bitsy-spider.